BOULDER, Colo. – The Colorado defense clamped down on Utah Saturday night at Folsom Field, preserving a 27-22 victory that earned the No. 9 Buffaloes their first Pac-12 Conference South Division championship and their 10th victory of the season. CU, improving to 10-2 and 8-1 in the conference, faces North Division champion Washington next Friday in the Pac-12 Championship game at Levi’s Stadium in Santa Clara, Calif.
No. 21 Utah (8-4, 5-4) took a 7-0 lead in the first quarter but never led again. The Buffs forced four Utes turnovers, the last a fumble returned for a fourth-quarter touchdown by linebacker Kenneth Olugbode that put CU up 27-16. Safety Tedric Thompson made a pair of interceptions, giving him seven for the season and tying him for the single-season school record. Safety Chidobe Awuzie also recovered a fumble for the Buffs and made a touchdown-saving tackle on a 94-yard Utah kickoff return. CU’s Sefo Liufau accounted for 326 yards in total offense (270 passing, 56 rushing) and two touchdowns. His 6-yard scoring pass to Shay Fields gave him 60 for his career, tying him with Cody Hawkins for the CU record. The Buffs last enjoyed a 10-win season in 2001, also finishing 10-2. It was the seventh 10-win season in school history. HOW IT HAPPENED: The Buffs survived a first-possession fumble by Liufau that was recovered by end Pita Taumoepenu at the CU 40-yard line. And as it did on Utah’s first possession, CU’s defense forced a three-and-out. But the short field following Liufau’s fumble still benefitted the Utes. Mitch Wishnowsky’s punt was downed at the Buffs’ 5. Three plays later, Alex Kinney’s low, relatively short (41 yards) punt was returned 55 yards by shifty Boobie Hobbs for the game’s first touchdown. Andy Phillips’ PAT put Utah up 7-0 with just over six minutes elapsed in the first quarter. And after the Buffs’ second consecutive three-and-out on offense, the Utes threatened to move ahead 10-0, but Phillips’ 45-yard field goal attempt fluttered wide right after a drive stalled at the CU 27. Taking over at their own 27 with 2:16 left in the first quarter, the Buffs ended the period – and a seven-play drive – with Liufau pin-balling in from the 2-yard line. He ran three times on the march for 21 yards and completed two passes for 49 yards – the longest a 42-yarder to Devin Ross. After Davis Price’s extra point, CU and Utah exited the quarter tied 7-7. After forcing another Utes three-and-out, Chris Graham capped a 14-play, 69-yard Buffs drive with a 25-yard field goal – his eighth of the season (12 attempts) – for a 10-7 lead. The Buffs might not have been satisfied with the three points; on the drive’s first play, a wide open Shay Fields dropped a slightly underthrown Liufau pass. And on the play before Graham’s kick, Liufau threw slightly behind an open Ross cutting across the end zone. CU’s next possession ended the same way – with another Graham field goal and even more frustration. After a superb fourth-and-one stuff by safety Chidobe Awuzie and linebacker N.J. Falon of Utes running back Joe Williams, the Buffs took over at the Utes’ 34. The next four plays saw them travel to the Utah 1-yard line. After Liufau lost a yard on second-down keeper, he lofted a third-and-goal pass toward H-back George Frazier, who had slipped unnoticed into the end zone from the left side of the formation. When the high-arching pass arrived, it was at Frazier’s knees – low but catchable. He dropped it, and the Buffs settled for a 19-yard Graham field goal that gave them a 13-7 lead that held through halftime. With its offense frequently misfiring in the first half, CU was kept afloat by its defense. 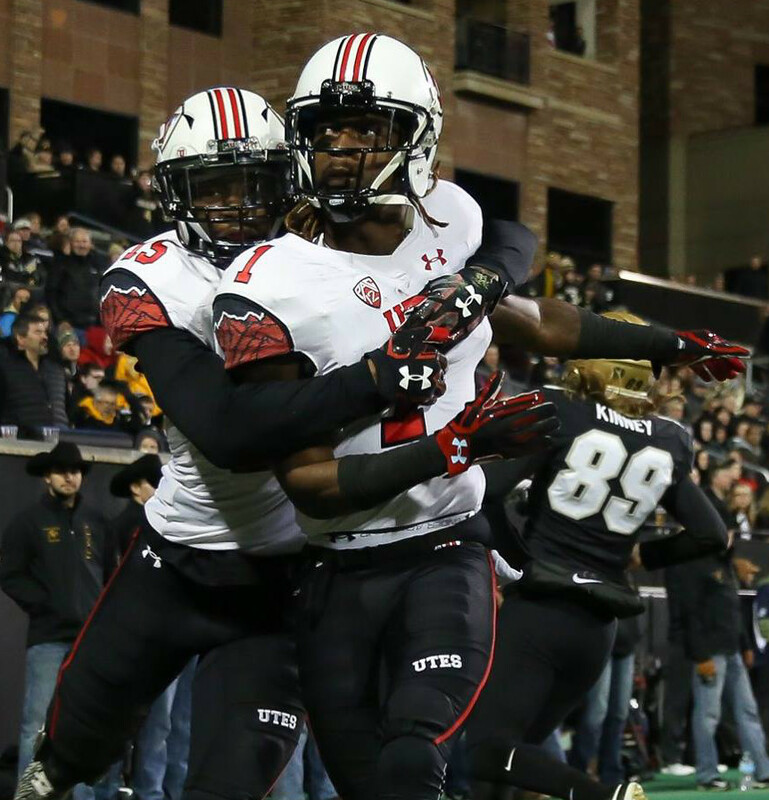 The Buffs limited the Utes to 56 yards rushing, 30 passing (86 total) and four first downs. Liufau completed 10 of 19 first-half passes for 121 yards while Utah QB Troy Williams managed only four completions for 30 yards in his 13 attempts. CU sacked him three times, Utah got to Liufau once. Receiving the second-half kickoff, the Buffs could have used a fast start and quick points. They got neither but the Utes did. While CU was limited to a pair of three-and-outs on its first two second-half possessions, Utah strung together a 7-play, 38-yard drive on its first possession and pulled to within 13-10 on a 22-yard field goal by Phillips. On their next possession the Utes appeared to be on their way to at least another field goal when Joe Williams, who had moved the pile for a 12-yard gain, was stripped by Ryan Moeller and the fumble recovered by Awuzie. The Buffs moved from their own 2-yard line to the 40, where on third-and-one, Liufau was stripped on a keeper. His second fumble of the game was leaped on by end Chris Hart at the CU 49. A reverse on Utah’s first play run by receiver Cory Butler-Byrd gained 41 yards to the CU 8. Three plays netted the Utes 4 yards. Phillips tied the game at 13-13 with a 22-yard field goal. The third quarter had 2:58 remaining, and it was just enough time for Liufau to drive the Buffs 75 yards for their go-ahead score. On the eighth play, he threw his 60th career TD pass – a 6-yard fade to Fields in the right corner of the end zone. Liufau’s pass tied Cody Hawkins for the school mark. Price’s PAT gave the Buffs a 20-13 lead with no time remaining in the third quarter, and the fourth quarter opened with near disaster for CU. Kyle Fulks returned the kickoff 94 yards to the Buffs’ 3-yard line, where he was chased down by Awuzie. The Utes’ first three plays were worth a minus-2 yards, leaving Phillips to kick a 23-yard field goal four plays into the fourth quarter. CU still led 20-16, but the Buffs had 13:53 – and the Utes – between them and their first Pac-12 South title. On Utah’s first play after receiving CU’s punt, linebacker Rick Gamboa punched the football out of Joe Williams’ grasp. Olugbode scooped it up and ran 10 yards to the end zone. Price booted the Buffs ahead 27-16 with 10:56 to play. Thompson’s second pick of Troy Williams cut another Utah possession short. The teams traded punts on the next three possessions, with the Utes opening what would their last gasp at their own 20 with 3:53 to play. It produced an 80-yard, 13-play scoring drive, with Troy Williams hitting Demari Simpkins with a 7-yard TD pass. Trailing 27-22, Utah went for a 2-point conversion, but Troy Williams’ pass for Simpkins was overthrown. An on-side kick attempt failed, too, with CU receiver Kabion Ento recovering at the CU 42. Needing to run 1:34 off the clock, Liufau handed off three times to Phillip Lindsay for 18 total yards. Then Liufau took three snaps, knelt three times and it was over. KEY STATISTIC: The Buffs created four turnovers – two interceptions, two recovered fumbles – and held the Utes to only six third down conversions in 21 attempts.